Rajputana, the modern-day state of Rajasthan, has been the scene of some of India's most famous battles and infamous court intrigues, and is home to its finest forts and palaces. 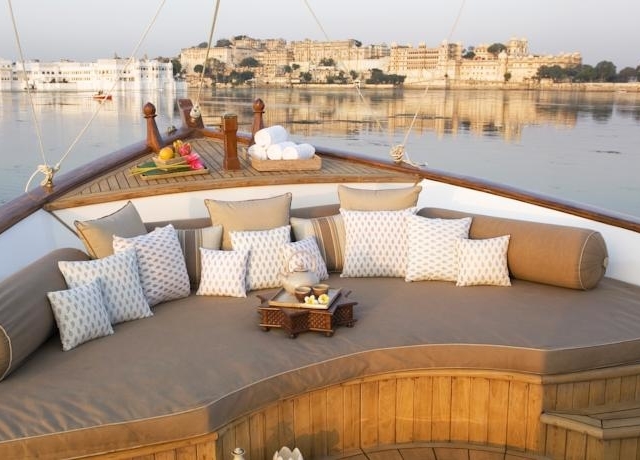 The magnificent Jai Mahal Palace, the idyllic Lake Palace and the secluded Palace Hotels are just some of the regal settings in which you will be treated like a maharaja. The forts at Jodhpur and Chittorgarh encapsulate the romance and chivalry of India's powerful Rajput Kings, while at the ancient capital of Amber an ascent on elephant-back recreates the majesty of a bygone era. Unique fresco styles and intricate miniature paintings adorn the Rajasthani palaces which were once inhabited by the most flamboyant ruling dynasties. While relaxing in the royal palaces, this tour rediscovers the majesty of this “Land of the Kings". • 13 Nights’ Accommodation in standard (Base) category Double AC rooms on twin sharing basis with private attached toilet & bath in 3 star & Heritage hotels. • Transportation at all places using 1 AC 4 door medium size sedan car for the entire duration of the tour starting from & finishing in Delhi including arrival / departure transfers, at all places as mentioned in the tour itinerary. • All presently applicable Central & State Government Taxes on hotels, road, toll & bridge. It is also inclusive of driver’s daily allowance, parking charges, gasoline, and vehicle insurance. Morning after breakfast proceed for Half Day guided tour of New Delhi. The city designed by Sir Edward Lutyens and Herbert Baker, redefined the architecture and urbanism of Delhi in the process of addressing contemporary imperatives- are truly majestic. The Presidential Palace, Parliament House and India Gate are all reminiscent of the British “Raj”. Drive through Delhi’s beautiful tree-lined avenues and the Diplomatic Enclave Enroute to the 12th century, 234-foot high fluted minaret of Qutab Minar (UNESCO World Heritage site) a soaring, 73 m-high tower of victory, built in 1193 by Qutab-ud-din Aibak immediately after the defeat of Delhi's last Hindu kingdom. Your tour will terminate with a visit to Humayun’s Tomb (UNESCO World Heritage site). This was built in 1565 A.D. nine years after the death of Humayun, by his senior widow Bega Begam. Inside the walled enclosure the most notable features are the garden squares (chaharbagh) with pathways water channels, centrally located well proportional mausoleum topped by double dome. Humayun was son of Babur and the second Mughal Emperor to rule India. Return back to hotel. Morning after breakfast, depart by surface for the Mughal splendor of Agra. On arrival, check into your pre booked hotel. 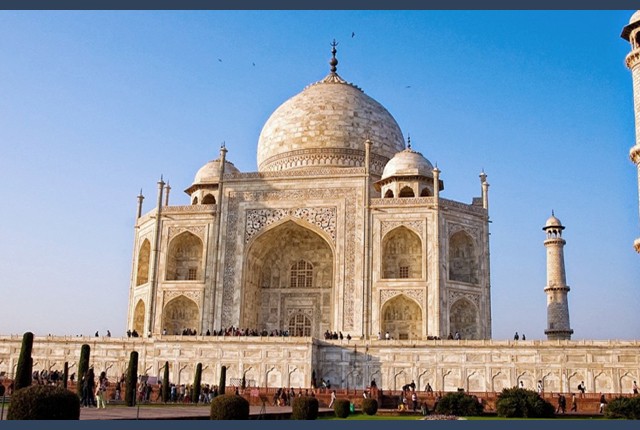 After fresh & change, proceed for guided sightseeing tour of Agra city & its surroundings. Begin your guided tour, visiting the mighty Agra Fort (Unesco Heritage Site) which lies across River Yamuna. An era marked by invasions and fortifications, where power was symbolized by grand palaces and grander forts…..during such time was built this awesome Fort and It was here that Aurangzeb, the 3rd son of Shah Jahan (the then Mughal Emperor) kept his father under house arrest till his final demise. Return to your hotel. On your return journey, visit Itmaudualla - a Mughal mausoleum, often described as a "jewel box", and sometimes called the "Baby Taj", the tomb is often regarded as a draft of the Taj Mahal. The mausoleum was commissioned by Noor Jahan, wife of Jahangir, for her father Mirza Ghiyās Beg, originally a Persian Amir in exile who had been given the title of I'timād-ud-Daulah (pillar of the state). Noor Jahan was also responsible for the construction for the Tomb of Jahangir and her own at Lahore. Mirza Ghiyās Beg was also the grandfather of Mumtaz Mahal (originally named Arjūmand Bāno, daughter of Asaf Khan), the wife of emperor Shah Jahan, responsible for the construction of the Taj Mahal. Return to hotel for breakfast. 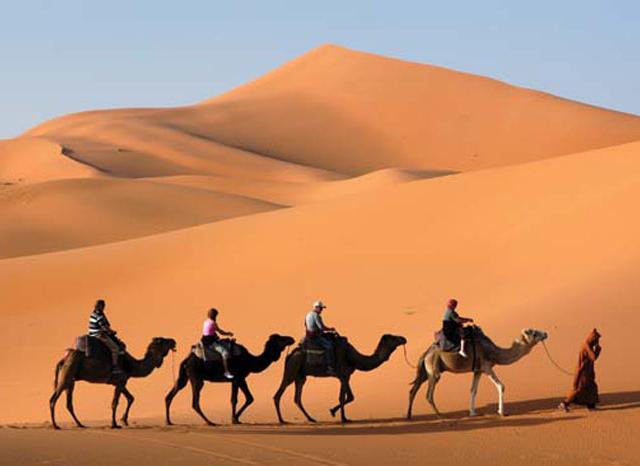 After breakfast complete check –out formalities and depart by surface for the city of Forts & Palaces –Jaipur. An exuberance of color, dance & song with traditional arts and crafts. Known as the 'Pink City' it is one of India's most well planned cities with wide straight avenues, roads, streets and lanes in a grid system. A few hours’ drive gets you to this land of Maharaja's, forts & Palaces and diversity of heritage & culture that is unique to the State of Rajasthan. Enroute to Jaipur, we halt for an hour or so to visit Fatehpur Sikri (UNESCO World Heritage site) the ghost city located 37 Kms away from Agra. On arrival you will be met by your Guide. Founded in 1569 by the Mughal emperor Akbar, it served as the capital of the Mughal Empire from 1571 to 1585. Built in red sandstone in honor of Saint Salim Chisti, who foretold the birth of 3 sons to Emperor Akbar, is an example of robust stability combined with originality. Each important edifice here represents a type by itself. Notable among them are the Diwane Khas, Punch Mahal, the Tomb of Salim Chisti, and the Buland Darwaza. Your Guide will help you in understanding the History of this magnificent palace. Morning after breakfast proceed for half day guided excursion to see one of the most impressive forts of Rajasthan. 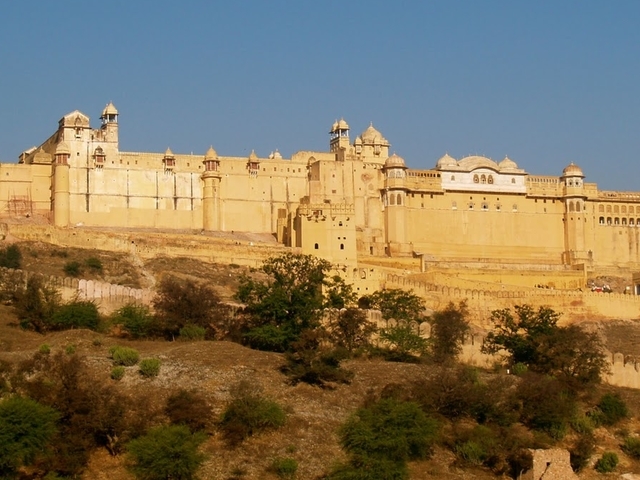 Visit the impressive Amber Fort taking an elephant ride to the main entrance gate of the fort. (In case of non-availability Jeeps will be used) The fort is situated 11 Kms from Jaipur and was the ancient citadel of the ruling Kachhawa of Amber, before the capital was shifted to the plains, the present day Jaipur. It is set in picturesque and rugged hills and is a fascinating blend of Hindu and Mughal architecture. Constructed by Raja Man Singh I in 1592 and completed by Mirza Raja Jai Singh the fort was made in red sand stone and white marble. Amber holds the history of a citadel, pulsating with a legendary past of 600 years & 28 kings of the Kachhawa dynasty. Return to hotel. Morning after breakfast, drive to Ranthambor National Park. This exciting journey through the countryside takes you home to the nearly a thousand year old Ranthambor Fortress where countless battles have raged around its walls. The Great Mughal emperor Akbar laid siege here and built the Lake Palace, summer gardens, temples, mosques, tombs and hunting towers, all overrun now by grass & shrubs. Today Leopards & tigers prowl the ruins. On arrival, check in to RANTHAMBOR REGENCY Resort. Morning after breakfast, proceed for another thrilling canter ride in search of wildlife. Later explore the imposing Ranthambor Fort dating back to 10th century. Ranthambor covers an area about 400 square Kms and has beautiful scenery. This National Park is very special and unison area where a natural present meets an historical past. This park has up to 32 tigers and has a considerable population of birds. It is one of the few reserves where the camera - shy tigers may be seen in daylight. The forests of Ranthambor were hunting grounds of the Maharajas of Jaipur. The park was declared a game sanctuary in 1955 & was given the position of a national park in 1980. The Park is famous for its tigers. One can often spot tigers in their normal pursuit during daytime. Today is a long day. Morning after breakfast, proceed for Half day guided city sightseeing tour of this magnificent city. Bundi also called the city of step wells was once ruled by the Hada Chauhans and was the capital of the great Hadoti Kingdom, renowned for its art and sculpture. Visit Sukh Mahal, a small, two-storied palace which was a summer retreat of past rulers. Today, it is quite famous for being the place where Kipling wrote ‘Kim’. (heavenly maidens). Return to hotel to complete check out facilities. Afternoon depart by surface for the historical city of Udaipur, en route halting to visit the impressive and historically important Chittorgarh Fort. It is one of the largest forts in India and is a World Heritage Site. The fort, popularly known as Chittor, was the capital of Mewar. It was initially ruled by Guhilot and later by Sisodias, the Suryavanshi clans of Chattari Rajputs, from the 7th century, until it was finally abandoned in 1568 after the siege by Emperor Akbar in 1567. It sprawls majestically over a hill 180 m in height spread over an area of 691.9 acres above the plains of the valley drained by the Berach River. The fort precinct with an evocative history is studded with a series of historical palaces, gates, temples and two prominent commemoration towers. Inside the fort -you have to enter through 7 gates to get into the main fort. Morning breakfast proceed for a full day guided excursion to Haldighati, 40 Km from Udaipur a site of immense historic interests as the memorable battle between Maharana Pratap & Mughal Emperor Akbar was fought here in 1576 AD. The Rana was badly wounded and defeated while his faithful horse Chetek died while crossing the moat. A memorial pillar has been set up here to honor the Royal horse. Next visit the ancient temples of Eklingji, built in 734 AD a complex of 108 temples enclosed by high walls devoted to Eklingji - the Deity of the Maharanas of Mewar, followed by a visit to Nagda, the first capital of Bappa Rawal. See the magnificent Tirana exquisitely carved with graceful Asparas and the Sas- Bahu Temple sphere built in 10th century AD. We finish our morning tour with a visit to the temple shrine of Nathdwara built in 17th century AD dedicated to Lord Krishna. It is one of the most celebrated of the Vaishnavas shrines. Return to hotel. Afternoon is reserved for half day guided city sightseeing tour visiting the City Palace. Here you will marvel at rooms with mirrored walls and ivory doors, colored glass windows and inlaid marble balconies and the Peacock Courtyard. Visit the 300-year-old Jagdish Temple and the Royal Cenotaphs of the Rajput kings followed by Sahelion- ki-Bagh, Fathesagar Lake, Pratap Samarak & the Sajjan Niwas Gardens before returning to hotel. Morning after breakfast, depart by surface for Jodhpur "The Sun City" founded by Rao Jodha, a chief of the Rathore clan, in 1459 lies on the southern edge of the Thar Desert. En route visit the temples of Ranakpur, set in a remote valley in the Aravalli range it showcases some of the finest stone carvings and sculptures in this 15th century Jain temple complex. The temples with its 29 halls & 1444 beautifully carved marble pillars are believed to have been built around 1439 A.D. The temple is dedicated to Tirthankar Adinath. Local legend has it that Dharma Shah, a local Jain business-man, started construction of the temple in the 15th century following a divine vision. Morning after breakfast proceed for half day guided sightseeing city tour of Jodhpur, also called the Blue City, due to most of the houses painted blue in the old city. You get a magnificent bird’s eye view of the city from top of the hill on which the majestic Mehrangarh Fort stands. Visit Jaswant Thada the white marble cenotaphs of Maharana Jaswant Singh surrounded by 4 other of later rulers. 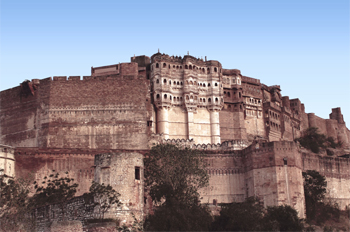 Next visit Mehrangarh fort situated on a 150 m high hill is one of the largest forts in Rajasthan. Seven gates have to be crossed to reach the fort. The gates still bear the marks of the various battles fought in the bygone era. Its second gate still stands witness to canon ball hits by attacking armies of Jaipur during wars. Other attractions include several palaces inside the fort, with their sprawling and huge courtyards. 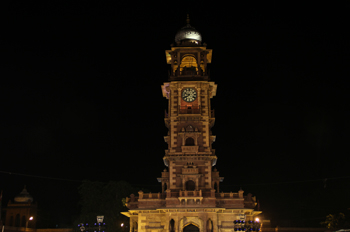 One of the fort's palaces, The Moti Mahal or the Pearl Palace, has the royal throne of Jodhpur, the Sringar Chowki. The fort also has galleries, temples, etc. Marvel at the exquisite carvings and lattice works on the sandstone walls of the fort. Visit the armoury and the museum located inside the fort premises .On your return journey walk thru Sojati gate to Sadar Bazar with its ornate & ancient clock tower. Morning after breakfast; proceed for half day guided city tour of Old Delhi. Visit the magnificent Red Fort, built at the zenith of the Mughal Empire in India. 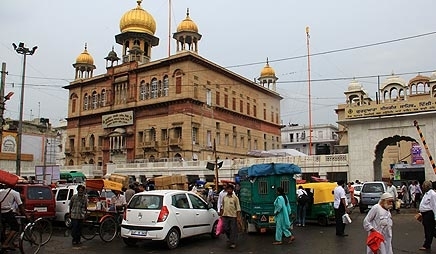 The centuries- old international market- place that sprawls at its feet is still one of Delhi’s most important commercial hubs: Chandni Chowk, or “Moonlight Square”. 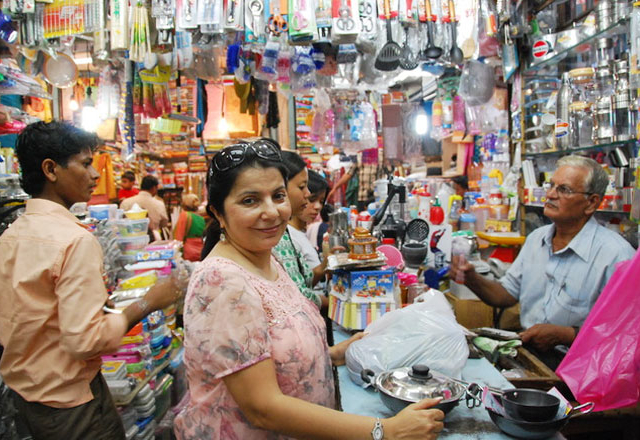 Walk or take a rickshaw ride (optional) through the bustling silver market and the wholesale spice market. The sounds, smells and colors of the bazaar, and the throngs of people who animate it make this an unforgettable spectacle. Visit Jumma Masjid. This great mosque of Old Delhi is the largest in India, with a courtyard capable of holding 25,000 devotees. It was begun in 1644 and ended up being the final architectural extravagance of Shah Jahan, the Mughal emperor who built the Taj Mahal and the Red Fort. Finish your tour visiting “Raj Ghat” – where lies buried Mahatma Gandhi’s ashes in his final resting place, before returning to hotel. END OF OUR SERVICES - We sincerely hope that you had an “incredible” experience while in India and take this opportunity to wish you a happy & memorable journey back home. Please note for Group Travel, Luxury Resorts or Luxury Train holidays & during Peak season (October to March) 100% (Hundred) is required minimum 90 days prior to travel date. • All disputes subject to Delhi Courts only. PLEASE NOTE THE FOLLOWING: - # Tour cost includes presently prevailing State and Government taxes, applicable on accommodation and transportation. In case of any hike in taxes, surcharge will be applicable. # Suggested hotels are subject to availability at the time of booking. In case the same is not available, then the best similar category will be provided # Tour cost is not refundable for any cause, once the tour starts # All tours subject to 100% advance payment minimum 30 days prior to start date. # Tour guide reserves the rights to make changes detour or omit any place of visit if it becomes necessary due to bad weather, bad road, strike or shutdown and any security reason. # Tourist will carry their luggage at own risk and responsibility; C’ MORE Travel & Tours or any of its associate agents, do not hold any responsibility for any loss of luggage during the tour. Get a Hassel free tour n travel with customized plan. Get all info n guidance by an experienced person. worth taking services for your holiday progm as an individual or family.